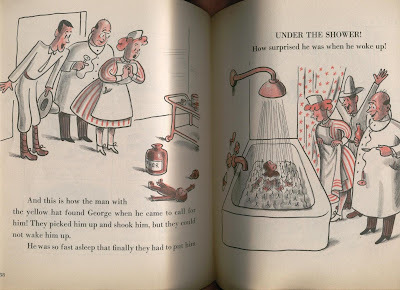 (all images from: Curious George Takes A Job, copyright 1947.). "He was a good little monkey _ but he was very curious." 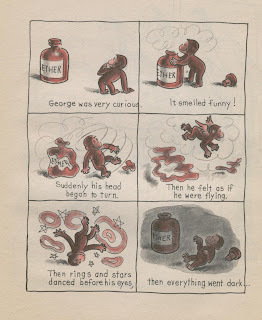 As a strong advocate of the simian races, I remember Curious George as one of the important role models of my youth. So I was sorely disappointed when I purchased "A Curious George Treasury" recently from Amazon.com for my son. Gone were the tales of mad monkey adventure I remembered. In their place were a bunch of predictable, harmless stories with the life and danger sucked out of them. My son wasn't interested at all. 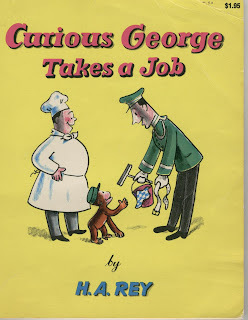 Then, while I was back home this month, I picked up one of my old Curious George books, called "Curious George Takes A Job" and it was every bit as good as I remember. My son loved it too. I figured out later that the "Treasury" they're selling on Amazon actually wasn't done by either the original illustrator or author. They date from around 2000. What a scam. 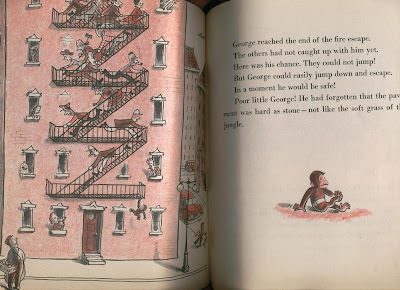 "Curious George Takes A Job" begins with George stealing his keeper's keys and busting out of jail. He then goes nuts with some spaghetti in a restaurant and has to wash dishes to pay it off. He gets a job as a window washer on a skyscraper and eventually breaks into somebody's house to paint it up like a jungle. When he gets chased away, he gets a compound fracture while jumping off a fire escape. This is the Way of the Monkey. But the ether incident is definitely the highlight. "There is nothing more helpless and irresponsible than a man in the depths of an ether binge." 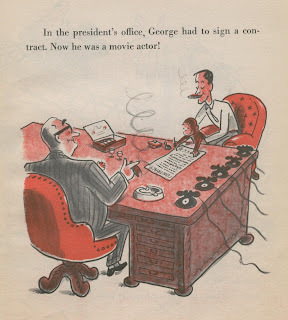 If you're wondering, the story concludes with The Man in the Yellow Hat smoking big cigars after landing a movie contract for the story of George's life.